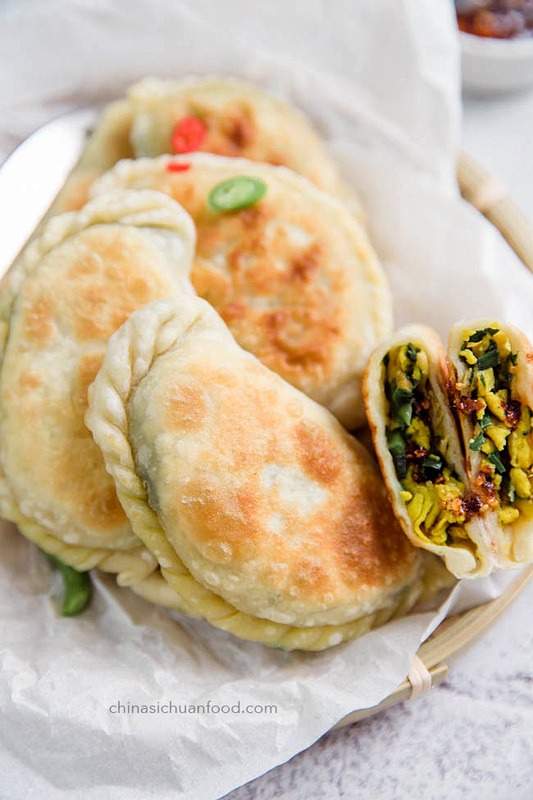 Chive and egg dumplings or This is a Chinese style pan-fried chive pancake with chive and scrambled egg as filling, known as Jiu Cai He Zi (Chinese chive pocket) in Chinese. 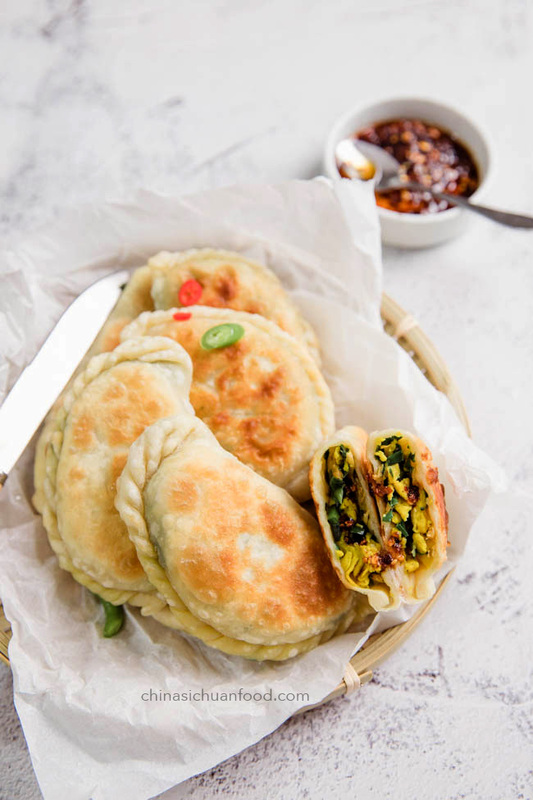 Previously I made Chinese scallion pancake which is a street food which is quite popular. Personally I eat those scallions pancakes mostly for breakfast. With a cup of soy milk, it is so warm. 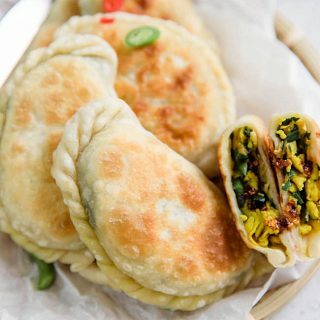 We call the chive pancake (Jiu Cai He Zi)韭菜盒子 meaning chive pocket. 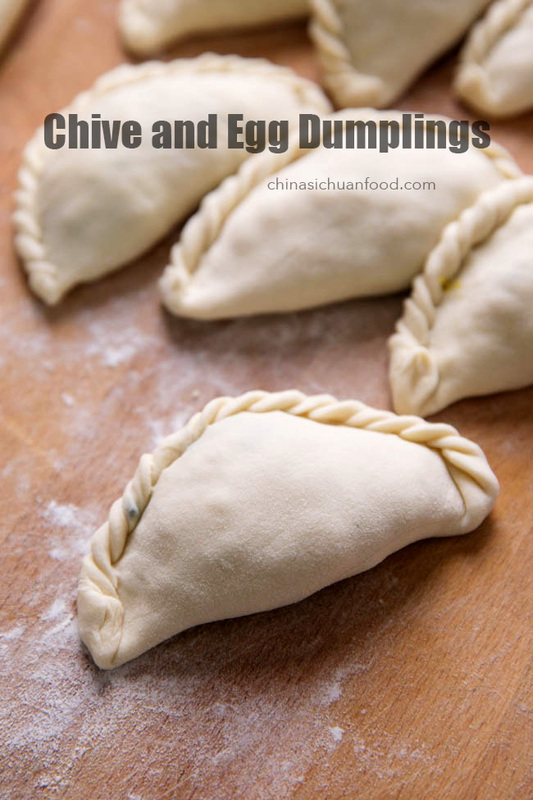 In fact, I would love to name it chive and egg large dumplings. 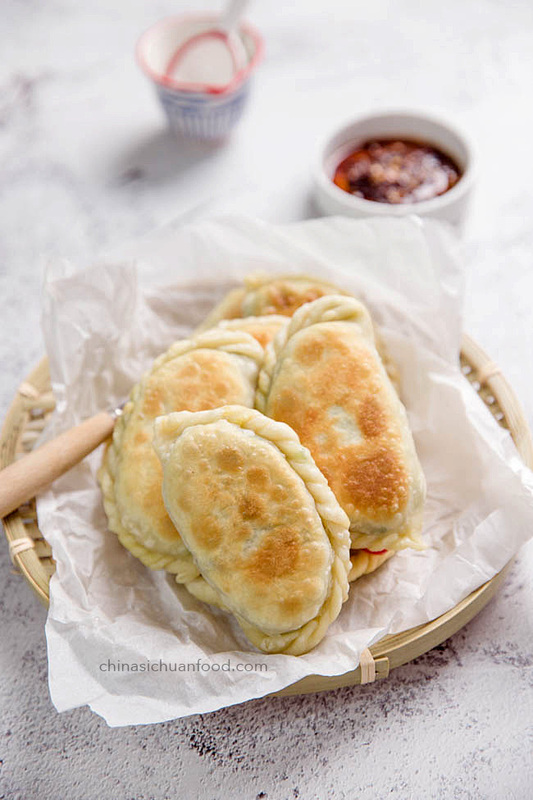 Since Chinese New Year is coming, this might be another good substitution for traditional Chinese dumplings. 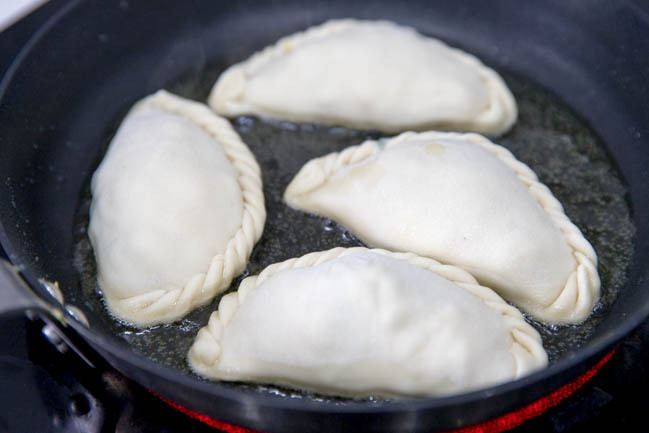 In order to create beautiful golden brown shell, use a large amount of oil and keep slow fire during the pan-frying process and move the dumpling from time to time. Coating chive with oil before mixing with the scrambled egg helps to hold the green color and avoid losing water. Chinese five spice powder, though used only a small amount in this recipe, creates a faint aromatic flavor. For the dough: you can use hot boiling water to make a hot water dough (烫面) or cold water to make a cold dough (冷面). Hot water dough is much softer than cold dough. But dough made with cold water produce a more crisp shell. Firstly we need to make the filling. 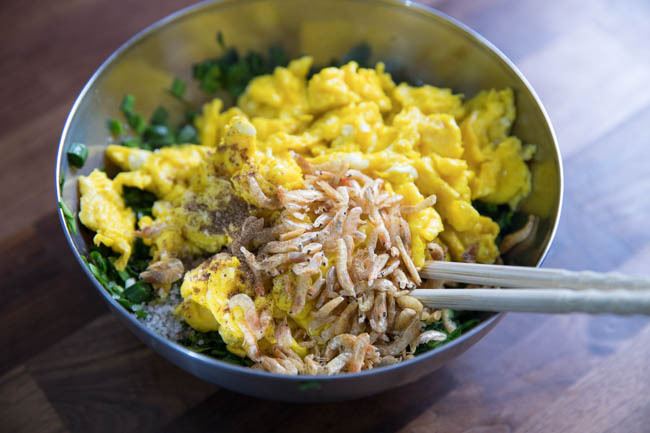 Mix chopped chive, scrambled egg and dried small shrimp (optional). Add salt, soy sauce and Chinese five spice powder to make the fresh filling. Since chive contains water, after pan-frying, we will get a juicy fillings. To make the dough, add flour, salt water, sugar and oil. Knead for 6-8 minutes over slow speed until smooth. Cover and set aside to rest at least 30 minutes. Sugar gives the wrapper a faint sweet flavor and oil make the wrapper more elastic and moist. The process of making the wrapper of those pancake is similar with making dumpling wrappers. But pancake wrappers should be larger than dumpling wrappers (around 2 times larger). 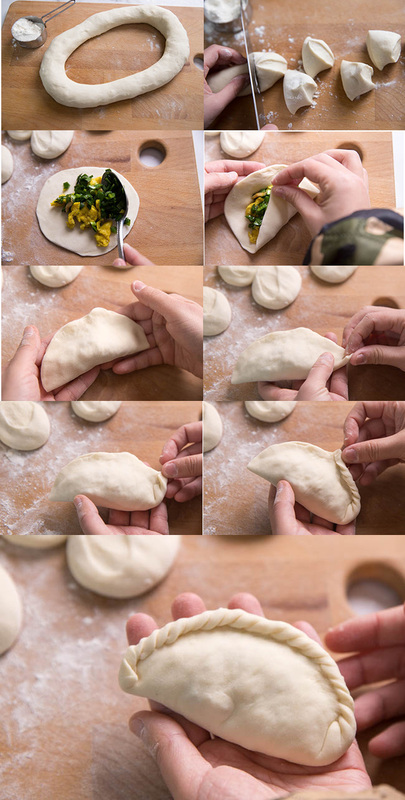 To fold the dumpling, roll out the wrapper and then place around 1.5 tablespoons of filling in center. Fold the two edges together and then use your thumb and index finger to spread a thumb size round from the edge of the wrapper and then repeat the action to create beautiful edges. Make sure they are completely sealed. Then pour some oil in pan, add place the pancakes in. Use slow fire to pan-fry. Crispy chive pocket with chopped chive, scrambled egg and dried small shrimp as filling. Crispy surface and juicy filling. Prepare the flour in a large bowl. Pour the water slowly to the bowl with flour and stir with a chop sticker. Stop adding water when there is no more extra dry flour. Set aside to cool down. 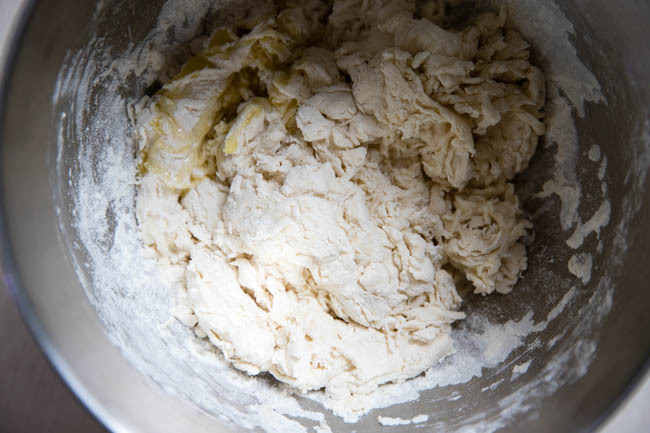 Then knead the flour into smooth and soft dough. Shape the dough into a long circle and then shape into a 2 long logs around 2 inches in diameter. Scatter some flour on your operating board and cut one of the flour log to 8 small equal portions. Flat the portion and roll out to thin wrappers around 15cm in diameter. Beat the egg in a small bowl. Heat up 1/2 tablespoon cooking oil in pan and stir-fry the egg. Cut the eggs into small pieces. In a large bowl, mix chive with egg pieces and dried small shrimps. Add salt, sesame oil and light soy sauce to make the filling. Assemble the dumplings one by one. Heat up 2 tablespoons of cooking oil in pan. Fry one side to golden-brown over slowest fire and then turn them over and slow the fire to fry until both sides becomes golden brown. You need to turn over several times during the process. You can use to make them as larger ones and then cut into small wedges before serving. Remove the hard ends of chive and then cut the tender parts into small pieces. 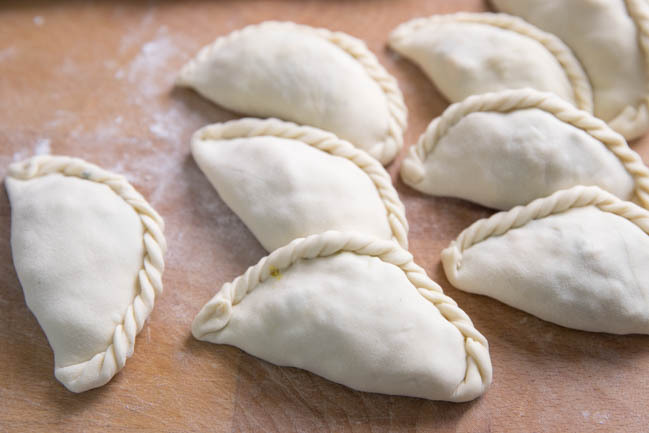 So please do not double about the amount as we do not add meat in the filling and we will end up with 16 chive pockets. And each pocket consume large amount of filling. If you feel this is really too much, you can reduce it to 150g or around. The dish is named as chive pocket as chive is the main ingredient, not flavoring ingredient.